First off, the Sun-Times has gotten a new owner/savior in Mesirow Financial’s Jim Tyree. He and his investor group seem willing to pour resources into the long-starved daily. Here’s hoping that they succeed. Next, one of the more exciting pieces of news involves the stepped-up interest by national dailies in providing local content. Both the New York Times and the Wall Street Journal have shown interest in covering Chicago with more on-the-ground resources than their existing bureaus. And while the Journal still is exploring how (and if) it might achieve such an objective, the New York Times already has signed up with a brand-new nonprofit news organization, the Chicago News Cooperative, to provide pages of local news for a Chicago edition of the Times that will be started later this month. Backed by WTTW-TV and the MacArthur Foundation, the CNC will be run by former Chicago Tribune managing editor (and former Los Angeles Times editor) James O’Shea, with board members that include former Tribune editor Ann Marie Lipinski and well-known journalist Peter Osnos. The most important additions to the Chicago News Cooperative, however, are its working journalists, and here, they’ve chosen well. In a coup, the cooperative went out and hired respected business columnist David Greising from the Tribune, and it also lured well-regarded longtime City Hall reporter Dan Mihalopoulos. Rounding out the CNC are retired Tribune photographer Jose More and a former Omaha World-Herald reporter, Katie Fretland. While it remains to be seen just what the cooperative’s output will look like, it’s a very promising development. And, the CNC is looking for other buyers of its content as well, which suggests to us that its role could end up being that of a thoughtful, local version of the Associated Press. It’s also noteworthy that the CNC will be far from James Warren’s only job. In a surprise development, Warren, who also has been blogging gratis for the Huffington Post, recently was hired by the Chicago Reader’s new owners to be the alt-weekly’s publisher. Warren is widely known as a generator of massive amounts of copy — even during his times as the Tribune’s Tempo editor, Washington bureau chief and Managing Editor for Features — so we wouldn’t bet against his ability to oversee the Reader *and* continue writing both for the Chicago News Cooperative and the Huffington Post. In a sad development, as part of Warren’s hiring, the Reader’s longtime associate publisher, Steve Timble, departed the paper. 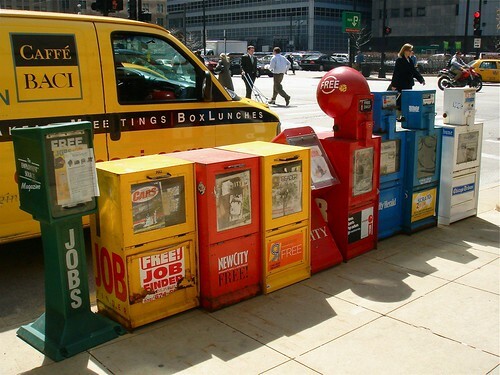 Another new outlet is a monthly tabloid called Chicago Current, which will be published by the staff of the now defunct, nonprofit Chi-Town Daily News. Recall that the Chi-Town Daily News was named Chicago’s top online news site last summer by #1 the Community Media Workshop in the study, “The New News: Journalism We Want and Need,” which was commissioned by the Chicago Community Trust with $25,000 of a $250,000 grant from the Knight Foundation. Chicago Current founder Geoff Dougherty sees the tabloid as Chicago’s version of Politico, and is aiming it at government insiders and political junkies. Dougherty has pledged to mail Chicago Current to every Chicago elected official and plans to leave it for free at commuter stops, a la RedEye. This month also saw the return of longtime Chicago TV/radio writer Robert Feder, who has begun a five-day-a-week blog at WBEZ’s Vocalo.org website. Feder, who took a buyout last fall after 28 years with the Sun-Times, had been out of the game for the past year while receiving a full year’s pay from the paper. Always a must-read, Feder’s column now has a different feel than his Sun-Times column did; Feder is no longer bound by space limitations, and the column also is far more broad in its reach, covering all forms of media. A recent column, for instance, was devoted to his former colleague, Sun-Times gossip columnist Michael Sneed. Longtime Washington, D.C. bureau reporter Mike Dorning resigned to joined Bloomberg. Computer-assisted reporting and education reporter Darnell Little quit to become an instructor at Northwestern University. Feature reporter Jason George, who most recently was working off the City Desk, departed. Southwest suburban bureau chief John Bisognano resigned to return to Florida; the paper’s new southwest suburban bureau chief is Pat Regan, who has worked in other Tribune suburban bureaus in the past. Midwest Issues reporter Tim Jones left the paper. Metro reporter Robert Mitchum departed. House & Homes reporter Shaila Wunderlich left the paper. Copy editor Joyce Garcia departed. Check out the Media Guide Forum to view the listing of recent new hires a the Chicago Tribune (you will be required to register to view the forum). 1 Anna Davlantes just got hired by WFLD-TV. 2 The Sun-Times just promoted national baseball writer Chris DeLuca to be its sports editor.